CES has become more of a car show than a tech show in the last few years, and this year just piled on the proof. In fact, CES was full of vehicles of all shapes and sizes, and many of them were electric. Sure, some were pure fantasy, but others were completely practical: the EcoReco M5 Air was collapsable, fun to ride, and came with decent mileage; Inboard showed up with an electric skateboard that doubles as a regular one; and Chevrolet gave us a ride in the Bolt — perhaps the first affordable electric car with proper range. But sometimes you just want to throw practicality in the gutter. Sometimes you just want to have fun, and this year that meant driving the electric equivalent of a three-wheeled motorcycle around Las Vegas. Arcimoto is a company that's based in Eugene, Oregon, where they've been making such three-wheeled electric vehicles for years. Each iteration brings improvements: better battery life, better range, and lower weight. The company's newest model, known simply as the SRK, exemplifies that progress. The eighth iteration is 700 pounds lighter than the company's last-generation vehicle, it has a top speed of 85 miles per hour, and it will be the first one to go into mass production. By simplifying the machine — like using handlebars instead of a steering wheel — they've dropped the target price for the SRK from nearly $20,000 to $11,900. 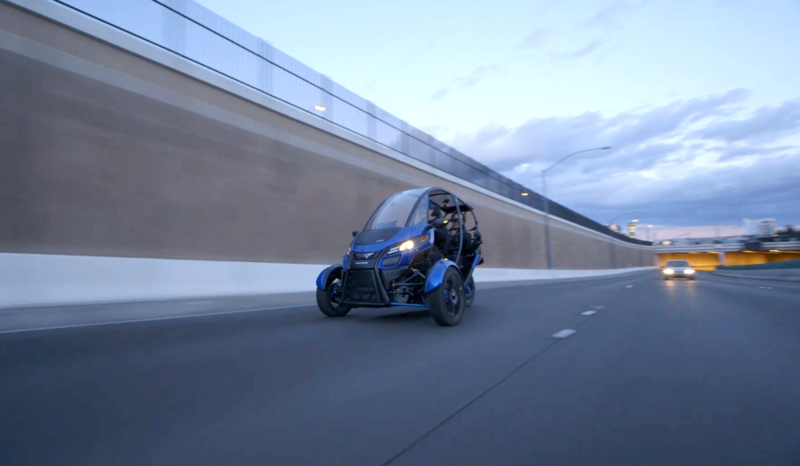 Arcimoto founder Mark Frohnmayer would argue that, at that price, the SRK is practical, especially considering people only drive an average of about 30 miles per day. And he might be right, because as fun as the SRK was to drive around Las Vegas, it also felt like a vehicle you could use pretty regularly. Let's start with the SRK's ride, which is incredibly smooth. There's not much to the vehicle save for the wheels, the seats, and the roll cage, but the suspension keeps most of the bumps at bay. I expected to be rattled around a bit, especially considering how light the SRK is, but it was a joy to ride. That experience is enhanced by the SRK's low center of gravity, which makes it even more fun to pilot around. The SRK's ride is also smooth because the seats are very comfortable. But the "interior" is a bit spartan right now, with little more beyond a touchscreen display that shows basic information like speed and range. 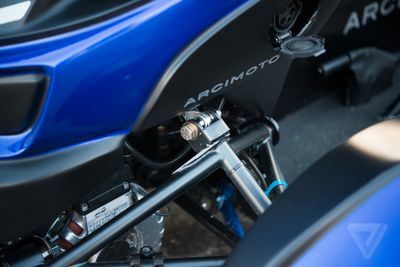 There's also a set of clamps that act as a phone dock in the center of the handlebars. (Arcimoto says customers use this mostly for Google Maps directions, but it's hard to imagine people resisting the temptation to check Twitter or Snapchat since it's right there.) You wouldn't want to drive the SRK in cold weather, either — I was pretty chilly while driving it around, especially thanks to a cold snap while we were in Vegas. Arcimoto says these things will change by the time the SRK enters production, though. The base model will have more basics like vents and heating for defrosting and some temperature control, and a full HVAC system will be available as an upgrade option. The company will also sell an enclosure if you don't want your ride to leave you exposed. But in the right climate, the SRK would be a lot of fun to have, especially because of how exhilarating it can be to drive the thing. Frohnmayer let me get my feet wet with the Arcimoto in the parking lot behind the legendary Vegas eatery, The Peppermill. Bobbing and weaving around the dozen or so light poles reminded me of being on a jet ski — you really have to stay on the throttle to make tight turns, which makes it more of a thrill to ride. On the open road, that agility was amplified. The SRK feels more maneuverable the faster you go. As I crossed 40, 50, and 60 miles per hour, the motorcycle handlebars were giving me almost too much control. Slight twitches left or right banked me toward the passing lane to my left or the guard rail to my right. That was doubly terrifying because of how exposed you are, even though you're strapped in by a four-point harness. After a few minutes at speed I finally got the hang of the experience, and my desire to own an SRK eclipsed my fears. The base model will have a range of 70 miles, which — as electric vehicles go — is on the border of being practical. 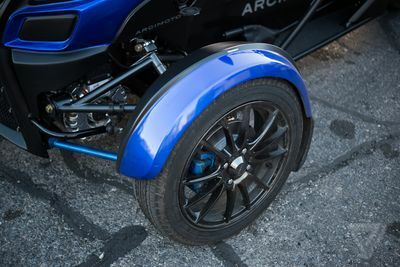 Arcimoto plans to offer an extended range model that will give riders 130 miles on one full charge, which makes it look a lot more like something you could drive every day. (Arcimoto says the base model's battery system will last at least six years.) 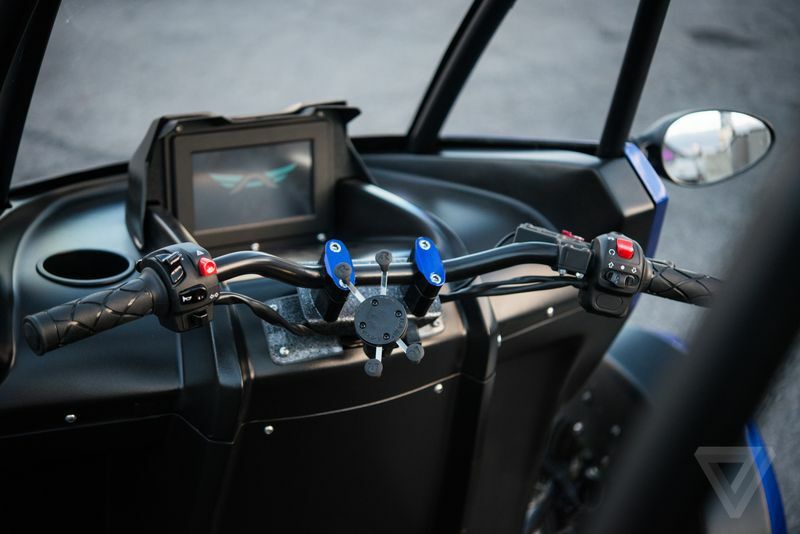 A regenerative brake on the handlebars lets you feed energy back into the system — which shows up on the dashboard — and the trike supports both Level 1 and Level 2 charging, so you can fill the battery back up at home or on the road. But the reason I'd really want an SRK is that it's just a pure joy to drive. The production version will do 0-60 mph in about seven seconds, which isn't going to win you many drag races, but it should be plenty enough to make your heart skip a beat when you crank the throttle. In fact, the throttle was limited on the version that Arcimoto brought to CES — it could only do 0-60 in about 10 seconds — and it was still a thrill to gun it every time a red light turned green. Arcimoto is still months away from production, so the company brought the only two existing prototypes of the SRK to CES. Frohnmayer and his small team have been touring them around the country, giving rides to the press and the public, and using the feedback to make small design changes on the fly. This seemed like a very smart idea for a small company to embrace — until I found myself stranded on the side of the I-15 freeway, that is. Our experience with the SRK actually took place over a few days, because the first day we took it out there was a problem with the hydraulic system. Arcimoto had recently changed a small lug on the hydraulic brake pedal, and it was keeping the pedal on my vehicle from fully depressing. That the brake was slightly engaged wasn't the problem — rather, the pedal was choking the whole hydraulic system. This kept my SRK from eclipsing 40-45 miles per hour, something we first realized once we were on I-15. More terrifying, though, was that the problem was draining the battery. We had set out with both prototypes at 99 percent, good enough for well over 40 miles according to Arcimoto. By the time we pulled to the side of the freeway, my SRK was down to 15 percent battery. We were luckily able to limp back to the hotel on the remaining charge. I was upset that the fun was cut short, but Frohnmayer was already on the phone with the company's technicians back in Oregon, and he assured me a fix would be swift. He was right. Two days later we met back at The Peppermill, and we took both SRKs around Las Vegas for well over an hour with no issues at all. It's somewhat of a tradition at The Verge to drive weird, crazy, three-wheeled vehicles at CES. Two years ago, it was Toyota's itty-bitty electric i-Road concept. Last year, it was the weird gas-powered prototype from Elio. I proudly accepted the torch when I hopped on the Arcimoto SRK and took it on the streets and highways of Las Vegas, and with all due respect to my colleagues, my ride was the most fun.